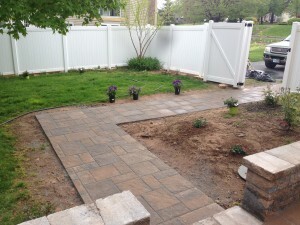 EasyPro Joint Stabilizer makes short work of finishing a patio, even in the rain! Solution: EasyPro joint stabilizer by Unilock. Not only can EasyPro be applied when it is going to rain, but it is actually applied with water! What do you think? Please leave us a comment below. We have some EasyPro on display at our warehouse, come on in and take a look! While you're here, you can check out our 2800 sf hardscape display, our multiple water features, and see our selection of landscape lighting fixtures.